I was looking through some old blog posts, and came across this one I had written back in 2006. As you know I've been writing for a long time about how to turn dreams into reality. Well, this article reminded me perfectly about how that happens. See that Aston Martin above on my Silver Lotto System website? I'll tell you how I got it. Isn't it funny how some particular events trigger you to do something? In my case, I'm talking about an ebook I bought yesterday on making an internet fortune... all because of a fancy car. As I've said to you many times before, I'm a car nut. I love exotic automobiles, and with the help of lotto I have a couple in my garage. 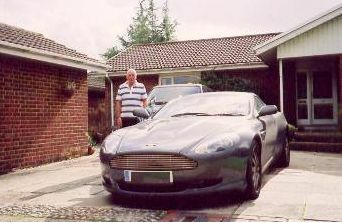 So when I saw this old guy had bought an Aston Martin DB9 from his profits on the internet, my ears pricked up. That's him and the car in the photo. For those of you who don't follow the exotic supercar market, this particular model is one of the most desired sports car in the world. It's on my wishlist. So he must be making a good deal of money. As it turned out, in one week he had made $36,000... almost better than lotto! But it was his car that made me click on the "buy Now" button. After all, I reasoned that a person with such good taste would also have something good to say. And I was right. It's an amazing way for anyone to make money off the internet without a website or very much skill. I learnt a lot. I'm getting off the subject a little. What I really wanted to talk about was how different forms of triggers get you started - and then keep you going at lotto. You need something to trigger you to buy the right system, then trigger you to keep you going. In this old guy's case, for me - it was his Aston Martin. For you, it could be seeing the hundreds of testimonies from my system's lotto winners that helps you to make the buying decision. That's your first trigger. Then you need the persistence and patience to keep going until you eventually make that top winning slot. So re-reading the testimonials is a great idea to keep you enthused. The article was just one of the many techniques I put into place to turn my dream into reality. And of course my own Aston Martin Vanquish landed on my doorstep just a couple of years later. One of the best methods to accelerate your goals is to put the object in front of you wherever you go. A picture is ideal. Carry it around in your wallet, or tuck it into your pocket and bring it out whenever you have the time. Keep looking at the photo to reinforce your goals. It works. Do this for winning the lottery too. Of course, you won't win the lottery directly as a result, but it will remind you to play often - which is one of the best ways to win using my system. Frequency and persisting with the play is the best way to win often. But you can only do that if you have a goal in mind to keep your enthusiasm high. I did it with the Aston Martin. Now, you follow through and see what results you can get!